UNICAF Scholarships 2019 for Online Study at University of South Wales. UNICAF Scholarships 2019…. Are you interested in studying online? If yes, here’s an opportunity for you. 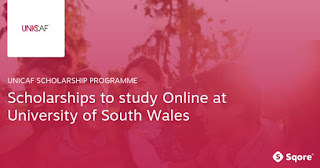 The University of South Wales offers Scholarships for students who wish to undertake their Bachelors or Masters degree program online. The University of South Wales is a major player in UK higher education. The University is renowned for its partnerships with major employers all over the world. The university has partnered with UNICAF to offer you scholarships for a variety of courses. Take the Sqore challenge now for a chance to win a scholarship. All you need to do is: take a short quiz and fill in your details! If you need us to feed you with more updated information at the right time about UNICAF Scholarships 2019, kindly provide us your phone number and email Address in the comment box below.